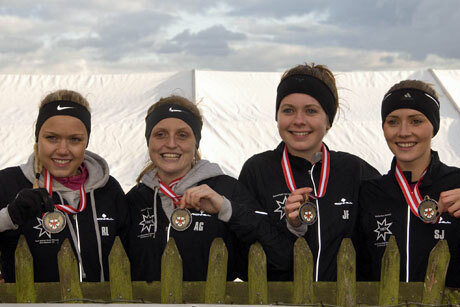 RHAC Ladies repeated last years stunning performance by taking bronze again at the ECCU National Cross-country meeting at Parliament Hill on Saturday 21/2 in front of around 8000 athletes and spectators. Whilst not taking the same prominence, it is good to recognise that RHAC mens team has been quietly maintaining a very respectable standard by a regular appearance, and relative success in the area and national events- 37th on this occasion with only teams from Notts AC, Leeds and Hallamshire (12th) in front. Kyle Craib leading the mens team home. Emma Parkinson leading the junior womens team home, Ryan Beale in the finish area, after his excellent 25th place in the U17 mens race and Luke Cotter finishing in the junior mens race.